The PowerBall is a great value because you can actually use all its sides. When the bottom of the ball becomes worn, just remove the retaining washer and bit, and attach them to the other side of the ball. The shape of the PowerBall allows you to turn the ball as needed without worrying about backing plates. The foam tabs can be pressed into crevices where flat foam pads can't reach. The PowerBall combines the best of hand polishing and machine polishing without any of the drawbacks so you get fast, professional results and it's very easy! DRILL NOT INCLUDED!!!! 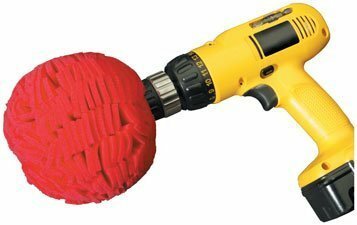 Easy to use and fits any hand drill, use many times over and over with amazing results. Hundreds of gentle foam fingers work efficiently to give you unmatched coverage with ease.